I hope you’ve had a fabulous summer. While I took a break from sending you my newsletter this summer, I certainly didn’t take a break from exploring new opportunities to enjoy a Vacation That Matters. I had a wonderful opportunity to end the summer with a 10 day vacation to Costa Rica. It was a time to bond and re-connect with family, to explore, experience and be utterly excited about recommending trips to Costa Rica. It was relaxing, adventurous, educational, inspiring and certainly memorable. We also celebrated our daughter’s 13th birthday and my birthday during the trip which made it even more special. However, our vacations are not complete unless we incorporate a way to give back. And we found so many ways to do just that in Costa Rica. From a volunteer visit to an animal shelter, to planting trees and exploring sustainable ranches, to visiting a school and donating school supplies, the possibilities were endless. So rather than write about all the details, I’ll just share the pictures we took. I hope that you can capture the essence of a Vacation That Matters through these images. Please share your thoughts, comments or inspirations via email, Facebook, or our website. May the new school year, fall colors, cooler temperatures, rejuvenated spirits, and planning for the upcoming holiday season bring joy and a smile to all. 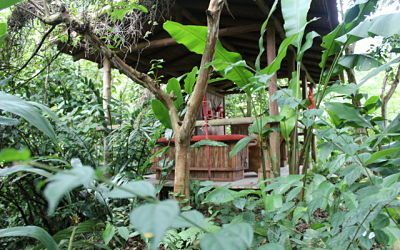 Imagine a rejuvanating massage in the middle of the rainforest with the sounds of nature. Imagine all the exhileration and adrenaline of adventure activities. Imagine the bio-diversity and natural beauty of flora, fauna, & wildlife. Imagine the educational experience of watching a sea turtle nesting on the beach at night. Imagine volunteering at an animal shelter. Imagine a country with a culture of environmental respect. Imagine the education in history, geography, ecology, anthropology and a culture of “PURA VIDA” (Pure life or Pure living). Now imagine sharing this experiential, recreational and truely sensational vacation with your family & friends!! HAVE FUN, SHARE DREAMS, and GIVE HOPE!!! Try a Luxury Voluntourism trip in 2012/2013. We have NEW itineraries for Costa Rica, Puerto Vallarta & Yucatan Peninsula, Mexico. Please give us a call for more details.